I know I’ve already shared all about the Kurayami Matsuri (Darkness Festival) mantou dance competition and parades of taiko, floats and mikoshi, but a festival just wouldn’t be a festival without the food! It’s always so much fun to wind through the food stands sampling a little of this and a little of that. You can very quickly eat enough for an entire meal so it was a good thing we were there for lunch and dinner otherwise we wouldn’t have had enough room for it all! We paced ourselves though and between festival events, we grabbed snacks and wandered around the nearby neighborhoods. One thing we always have to get at festivals is kushiyaki (skewered grilled food). We had some roast beef and galbi on skewers but unfortunately the photo I took was focused on the ground, not the juicy treats on sticks…photo fail! I’ll have to be extra diligent to get a good photo the next time I have some. My husband just had to get this dish of gyouza wrapped in chicken skin. He assured me it would be much better than I imagined. Sadly it was just not for me. He enjoyed them so I’ll just leave those to him from now on. 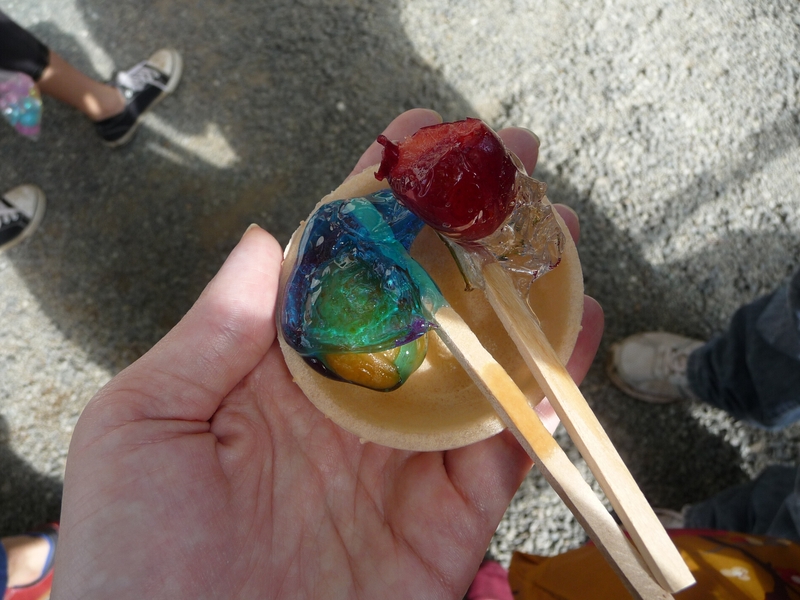 A few stands had candied fruits called mizuame (水あめ, “water candy”) so I thought I’d give them a try. We got strawberry and mikan, a citrus fruit. The fruit was covered in two different flavors but I didn’t think the coatings had much of a flavor other than adding a mildly sweet and very sticky quality to the slightly tart fruit. 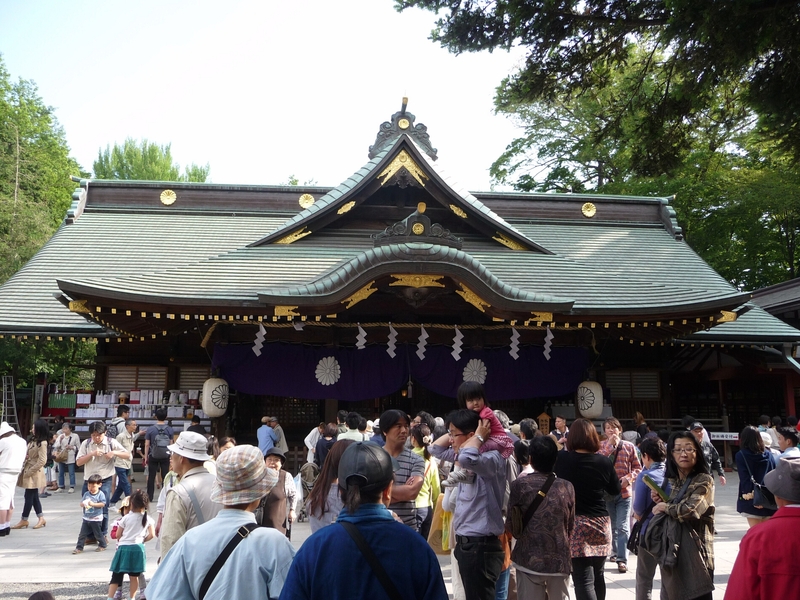 After finishing our midday snacks, we visited the Okunitama Shrine where the festival was being held. Six different shrines in the area were consolidated and their deities were all moved to this shrine, making it one of the major shrines in Tokyo. 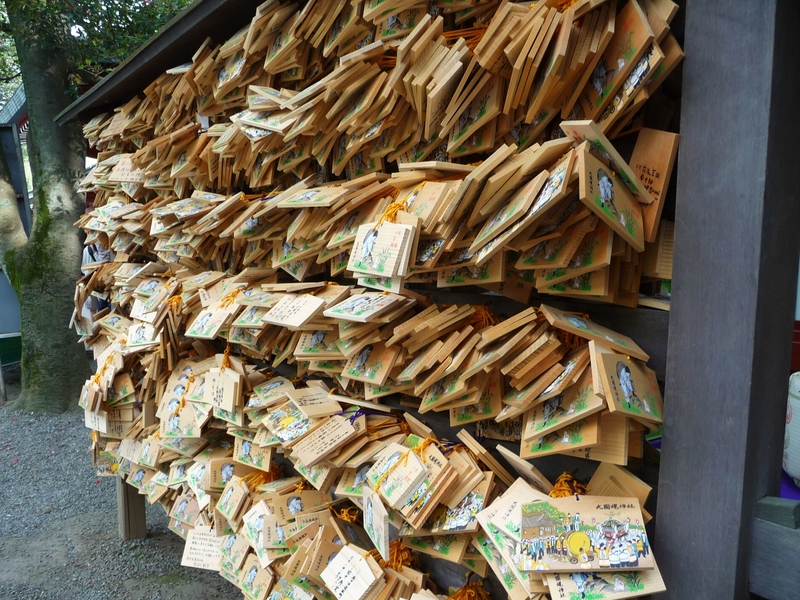 These ema (絵馬) are sold at the shrine. Visitors can write their wishes or prayers on the back of the ema and then hang them here so the deities can receive them. It looks like the festival crowd had a lot of wishes to offer up! We also noticed some games for children going on in the festival area near the food stands. 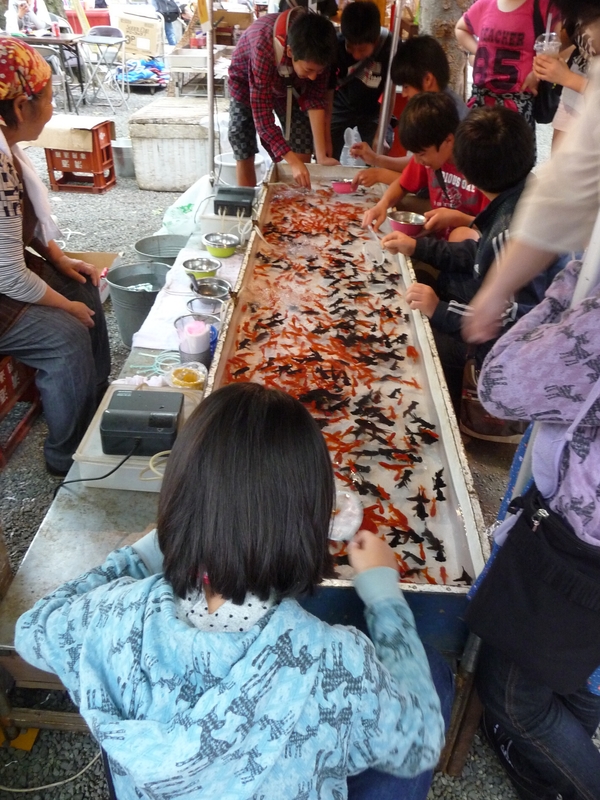 One that I really enjoy and am always ready to play despite being a bit older than the average customer is the goldfish scooping game called kingyo-sukui (金魚すくい). 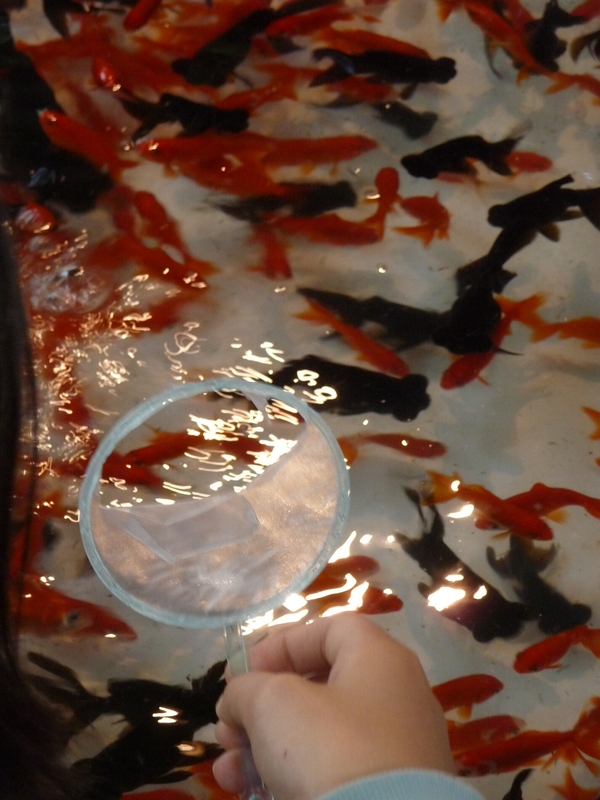 The goldfish are in a fairly shallow tub of water and your only tools for catching them are a small paper scoop called a poi and a small bowl. The objective is to use the poi to scoop the fish out of the water and into your bowl but you’re not allowed to actually put the bowl into the water. Since it’s made of paper, the poi breaks easily once in the water so you have to move quickly enough to catch the fish but not so quickly that you break the paper. You can continue as long as there is still some paper left in the frame of the poi but the more it’s torn, the harder it is to catch the fish. Don’t worry, this player already had three or four goldfish in her bowl. You can take home all the gold fish you catch or sometimes you can turn them back in for a small prize. 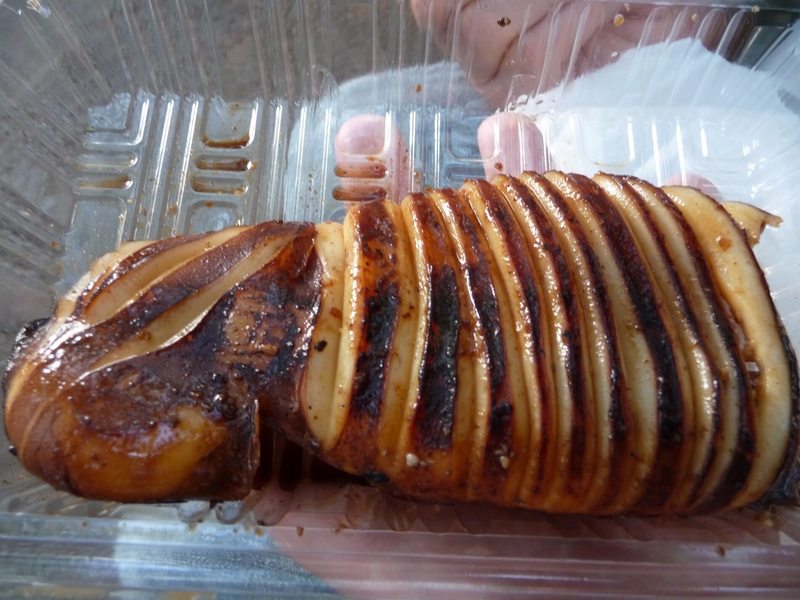 As the day wore on and we returned to the food stands to browse, we found some ikayaki (いか焼き, grilled squid) to try. You could choose the squid portion you wanted and then it was grilled right in front of you. We passed up the tentacle portions for one that appeared to be an entire squid body. The meat was very tender and didn’t have that super chewy quality that I think squid can have if it isn’t prepared well. Ours was prepared very simply with a soy sauce glaze and it was delicious! One cannot live on squid alone so we continued our food stall trek. My husband picked out a hot dog and karaage (fried chicken) but I wanted to try a hashimaki stand I’d seen earlier in the day. 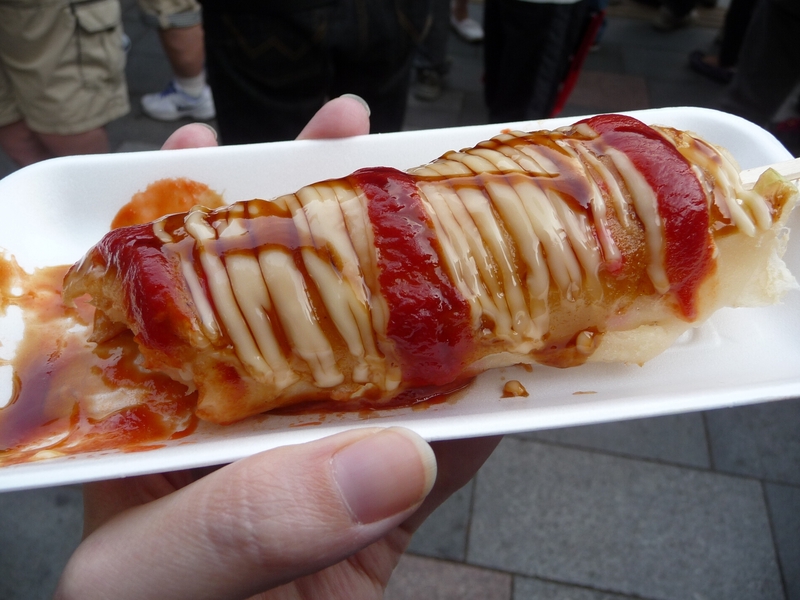 Hashimaki is basically okonomiyaki (a kind of savory pancake) wrapped around a pair of chopsticks. There was quite a long line for this one but it allowed me time to watch them making the food. 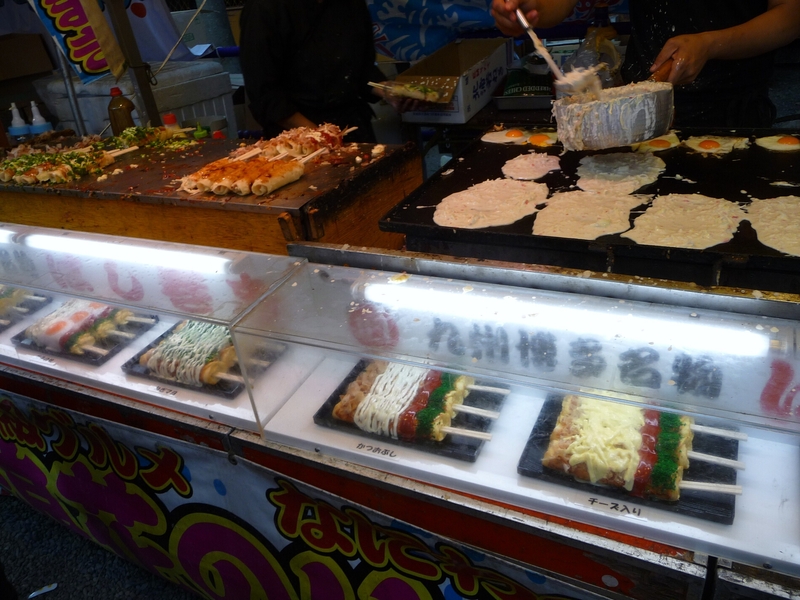 You can see the vendor pouring the batter with shredded cabbage on the pan as eggs fry next to them. There were several different varieties to choose from but I went for the cheese version. There was very little cheese in this one but it was just the right amount to go along with the savory pancake topped with ketchup and mayo. 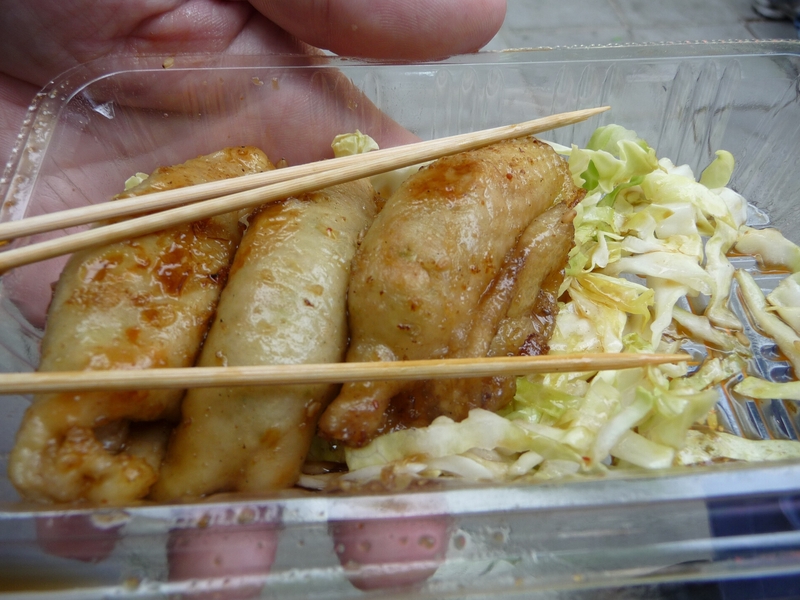 And since it was wrapped around chopsticks, it was very easy to eat as we walked around the festival. This is definitely another favorite! 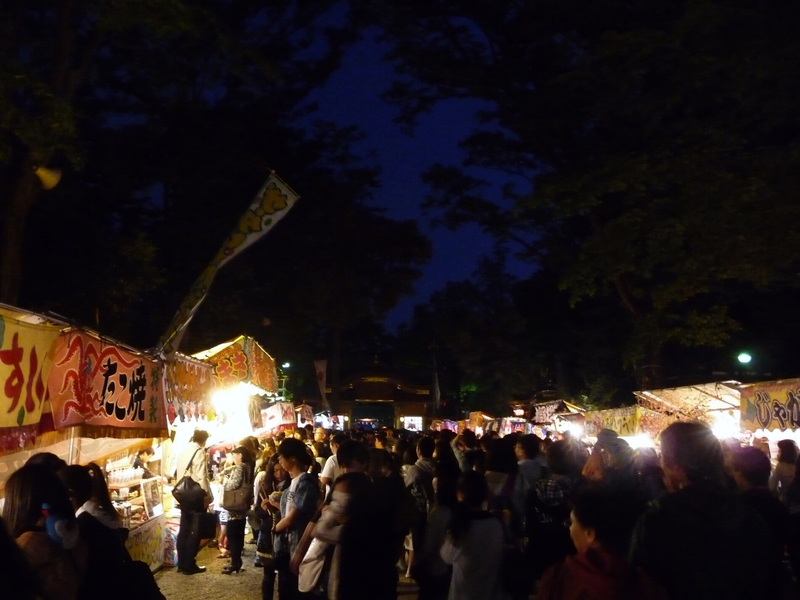 Even after the parades were done, the food stalls leading up to the shrine were packed with festival goers. I loved the atmosphere of the festival with so many people chatting happily with friends and family, cheery lights showing off the vendors wares, and the smell of delicious foods wafting through the air. Ah, festivals of Japan, I’ll never grow tired of you.